The newly launched LG V40 ThinQ might very well be the best smartphone the Korean phone maker has made thus far. While not the first mobile device to do so, the LG V40 comes with a total of five cameras – three at the back and two at the front. This information was already confirmed to us when we had presented exclusive 5K renders and images based on factory CAD data. With the way this device has been priced, it faces fierce competition from devices such as the Samsung Galaxy Note 9 and the Huawei P20 Pro, where the latter also happens to offer a triple camera setup at its back. Sony Xperia XZ3 and the LG V40 ThinQ both will receive their respective first updates shortly. While Sony's flagship device, which is already out in the market will receive an Android Security update for the month of October among other things; the LG V40 ThinQ update will be centered around its camera features. LG launched the LG V40 ThinQ, the successor to the LG V30 which gets similar but upgraded specifications of LG G7 ThinQ along with LG Watch W7 the Korean company's first hybrid smartwatch and comes with cool features and a new operating system. Both the devices have been released in the United States and currently awaiting confirmed release date in India. LG announced its flagship device LG V40 ThinQ on October 03 that possesses five cameras; three rear cameras and two front shooters, which was already evident through some leaked images that came out a day before the announcement. The device features a 6.4 inch screen with a aluminium frame and runs on Android 9 Pie. The LG V40 ThinQ price in India is Rs 49,990 for the 6GB + 64GB internal storage variant. The phone is available in 3 variants: Blue, Grey, Platinum. The phone was launched in India on 24 January 2019. Inside, the LG V40 ThinQ will comes equipped with the Qualcomm Snapdragon 845 processor with an octa-core CPU (4x 2.8GHz Kryo 385 Gold CPU + 4x 1.7GHz Kryo 385 Silver CPU) and Adreno 540 GPU. Just as earlier reports had indicated, the phone indeed features 6GB of LP-DDR4X RAM paired with 64GB of internal storage space. Further storage expandability using a microSD card is possible up to 512GB. Unfortunately, LG has not provided any details regarding a 128GB storage variant. Also, the device is still running Android 8.1 Oreo with its own custom launcher on top. However, the update to Android 9.0 Pie should be just around the corner. In the imaging department, we get triple-cameras at the rear and a dual-cameras at the front. The main camera is a 12MP sensor with 1.4µm pixels, an f/1.5 aperture, and 3-axis OIS. This happens to be the first camera from LG to offer Dual Pixel autofocus. Then we have the second sensor which is a 16MP ultrawide lens with an f/1.9 aperture that lacks autofocusing abilities. The third lens is a 12MP telephoto camera with an f/2.4 aperture. This lens also boasts OIS and additionally offers with 2X optical zoom. The LG V40 ThinQ keeps the 32-bit Hi-Fi Quad-DAC and DTS:X 3D Surround Sound, something that has always been a part of LG’s high-end phones since the LG G5. It features a 3.5mm headphone jack and stereo boombox speakers, an upgrade from G7 ThinQ’s single boombox speaker. There is a USB Type-C port at the bottom and a hybrid dual-SIM card slot on the left side of the phone. Most LG V series phones in the past have come packed with 3300mAh batteries, which is lower capacity than most high-end phones these days. The V40 ThinQ is unfortunately no different in this regard and comes the exact same capacity cell. However, you do get support for Quick Charge 3.0 over USB Type-C along with ‘fast’ wireless charging. What About The Design Of The LG V40 ThinQ? As we had previously revealed in our exclusive report, the design of the LG V40 ThinQ is largely similar to that of the LG G7 and the previous LG V series smartphones, except for the presence of the triple-camera setup at the rear and the screen notch at the front. The build remains the same: glass-and-metal sandwich design. From the looks of it, at the front, the LG V40 ThinQ has a screen which covers most of the front fascia of the phone, with curved edges on the right and left side. At the top, there’s very thin bezel, with the only sizeable part left in the form of a screen notch where the earpiece and the dual-front-facing camera setup are housed. There’s a small chin below the screen. The phone measures 158.7 x 75.8 x 7.79mm and weighs 169g. From the front, if you let go of the notch, it almost looks like the Samsung Galaxy S9. At the rear, it all starts getting interesting. With the V40 ThinQ, LG is moving to a Huawei P20 Pro-like triple-camera setup. However, it’s laid out horizontally, unlike the P20 Pro and the recently unveiled OPPO R17 Pro. Below the triple-camera setup, there is a circular-shaped fingerprint reader. There’s the V40 ThinQ branding and the LG branding. On the right side of the phone, there’s the power button. On the left side of the phone, there are three buttons: two volume controllers and one other button which is meant to be a dedicated trigger for Google Assistant. This placement could be confusing for those moving over from previous LG V-series phones which had their power buttons on the left. You can disable it if you don’t plan on using it, but sadly there is no option to remap it. Good thing, LG hasn’t ditched the 3.5mm headphone jack just yet. The phone has been IP68-certified for dust and water resistance. Moreover, the new device is even MIL-STD810G compliant (something we absolutely love about LG’s premium phones). In the rear-facing imaging setup, the LG V40 ThinQ bears a 12MP primary sensor with ƒ/1.5 aperture and 1.4?m pixels. This lens offers a 78-degree field of view. The secondary camera sensor features a 16MP resolution with ƒ/1.9 aperture and 1.9?m pixels. This wide-angle lens offers a FOV of 107-degrees. The third camera sensor on the phone’s rear is a 12MP telephoto lens with ƒ/2.4 aperture, 1.0?m pixels and 2x optical zoom equivalent field of view. At the front, the phone houses a standard 8MP shooter with an f/1.9 aperture which is paired with a wide-angle 5MP sensor with an f/2.2 aperture. In real-world usage, this triple rear camera setup does offer a flexible and versatile experience. Each camera can be used independently depending on how you want the final image to look like. If you cannot make up your mind, there is a Triple Shot feature which takes an image from all three cameras. However, this happens in sequence and not simultaneously, which could result in blurry images if either the phone or subject moves. Then there is the fact that all three cameras are so different from each other that the resulting shots can vary greatly in terms of their composition, colors and overall clarity. The phone is able to record 4K videos at 60fps, so that’s a plus. It is also capable of recording 1080p videos at 30fps, 60fps and 240fps (slow-motion). LG V40 ThinQ: Will It Be A Good Upgrade From LG V35 ThinQ? The LG V40 ThinQ comes with a screen that’s similar to that of the V30, V30s ThinQ, and the LG V35 ThinQ, but it has a notch. There are two ways to think (pun intended) about it. It brings a higher screen-to-body ratio but also a notch that gets in the way. However, LG’s way of handling a screen notch is much better than what Apple offers. I am okay with a notch as long as it doesn’t come between me and the game I am playing or the video I am watching. If you’re someone who hates a screen notch, no matter what, then the V40 ThinQ doesn’t look like a good upgrade from previous-generation LG V series phones. On the other hand, the processor remains the same, and so does RAM and storage. The two primary aspects that have actually received an upgraded are the camera setup and loudspeakers. The V40 ThinQ offers a triple-camera setup at the rear and stereo BoomBox loudspeakers. The battery life is about the same as well. So, coming from the V35 ThinQ, there is no denying that the triple camera on the new phone does open up more possibilities, but will not be a major upgrade compared to what its predecessor already offers. If you can resist, you should most probably be able to stick to the good-old V35 ThinQ, for a few months more. LG V40 ThinQ: Is It Better Than The Galaxy Note 9? Both the Galaxy Note 9 and LG V40 ThinQ feature similarly sized displays with about the same resolution. There isn’t a lot to complain as both are OLED panels with support for HDR10 playback. The only real difference is with the notch on LG’s flagship while the Galaxy has still not given in to this trend. The processing power is similar as well thanks to the Snapdragon 845 chipset and 6GB of RAM. Storage freaks will be impressed with the Galaxy Note 9’s 512GB storage variant offering. However, most people should be satisfied with the V40 ThinQ’s 64GB and 128GB storage variants alongside the provided microSD card slot. Coming to the design, both phones feature a glass-and-metal build, with curved edge screens. Both phones are IP68 certified for dust and water resistance. The S Pen could become a deciding factor while making a purchase decision between the two. 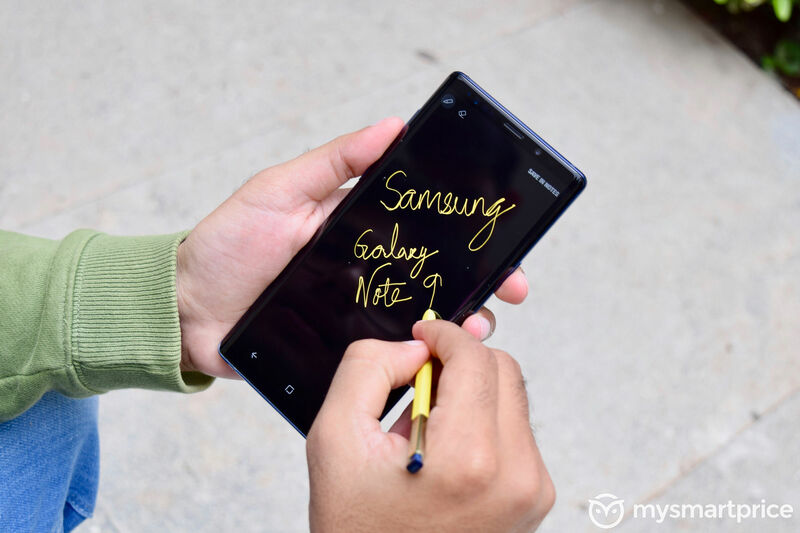 Even if you’re not a fan of jotting down notes or scribbling on your phone’s screen, the new S Pen should be helpful in a lot of scenarios such as clicking an image (group pictures or self-portraits) from far away, skipping music, scrolling a webpage, or controlling presentations. Both phones feature stereo speakers and 3.5mm headphone jack. LG’s Hi-Fi Quad-DAC can win you over if you’re an audiophile. In the imaging department, the LG V40 ThinQ appears to be a more flexible solution, thanks to an additional ultra-wide-angle camera. Both phones can record 4K videos at 60fps. But with that said, the overall image quality is relatively more stable and consistent on the Note 9. Even the battery capacity of the Note 9 is much higher at 4000mAh, while the 3300mAh cell of the LG V40 ThinQ leaves us wanting for more. Furthermore, extras like the S Pen and Samsung Pay at only a marginally higher premium do sound more enticing. When Will The LG V40 ThinQ Go On Sale? So far, LG has only announced the US sale details for the V40 ThinQ. Depending on which carrier you opt for, pre-orders for the device shall commence from either October 11 or October 12. Sales for the phone will begin from October 18. 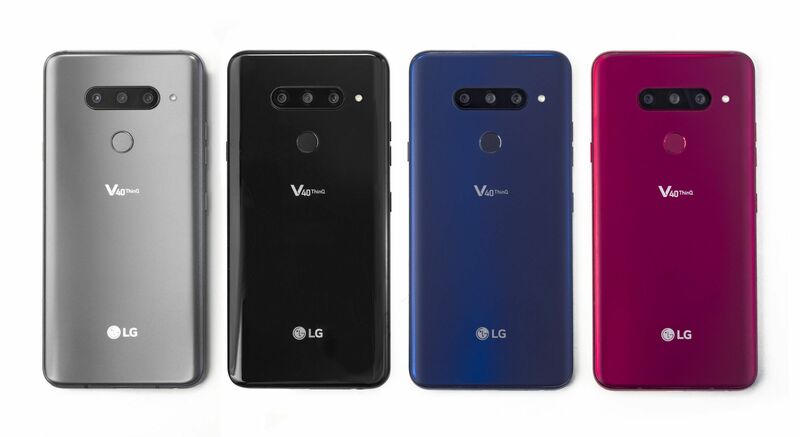 What Colours Is The LG V40 ThinQ Offered In? Similar to the LG G7 ThinQ and the LG V30, the LG V40 ThinQ is offered in four colors — Aurora Black, Moroccan Blue, Platinum Gray, and Carmine Red. However, only the first two color variant will go on sale in the US for now.